Arrive in Kathmandu Airport & Transfer to Hotel. Welcome dinner in the evening. 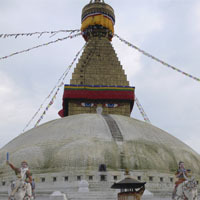 We will be visiting three of the famous heritage sites in Kathmandu. You will visit first the Swayambhunath Stupa.It is said that Swayambunath Stupa is more than 2,000 years old, and it symbolizes knowledge. The painted eyes on all four sides symbolize the all-seeing power of Buddha. It is an important Buddhist place where pilgrims from all over the world come. One of the holiest shrines in the world, The fabulous pagoda houses the linga of Lord Shiva and people bath in the Bagmati River with a faith of cleansing themselves spiritually. Many Sadhus or Hindu Ascetics live here. During religious festivals, Hindus come to make offerings, and it is sometimes very crowded. Bhaktapur Durbar Square: This former royal palace complex offers the elegant 15th century Palace of 55 win-dows, artistic courtyards, the Golden gate. Patan Durbar Square: Durbar Square an enchanting melage of palace buildings, courtyards and pagoda temples, is the center of Patan's religious and social life. Pokhara to Kalikasthan ( : Treks start after drive approximately half an hour by a taxi Alternatively, reserve bus from Pokhara bazaar to Bijayapur khola .The route along to Kalikasthan is mostly inhabited by Brahmans and Chetries. 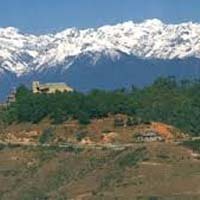 Kalikasthan to syakhung 1780m: Also known as Gurung village .The trails continue through Jungle thujakt than Naudada with provisional teashop and camping at syaklung. Syaklung to Chisapani 2200m: Dana literally (ridge top) where set camping. Gives a breath taking views of Annapurna II Lamjung himal, Manaslu, Himchuli, and so on. Initially trail descends steeply down to Chautari. The trail twists west leads to Begnas Tal, Likewise east to Marshyangdi Khola.The Royal Treks trail climbs towards the camping spot Chisapani. 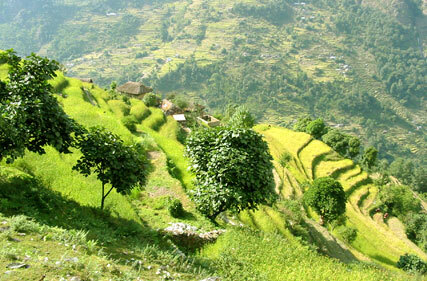 Chisapani to Pokhara: Trail follows steeply down for an hour to reach into a small valley with a small stream. Trek will end at Pokhara after drive approximately 12 K.M from Begnas Bazar by a taxi or a reserved bus and camping at Pokhara or hotel . 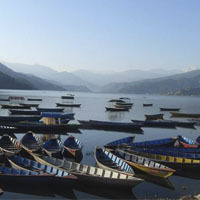 POKHARA An enchanting Himalayan Valley: if Kathmandu is the cultural hub of Nepal, then Pokhara is its center of adventure.